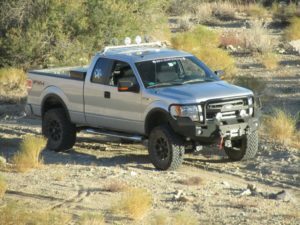 What Size Winch Should I Get for My Pickup? You may be asking yourself, “What size winch should I get for my pickup?” Winch sizes vary just as do the sizes of trucks and vehicles that you might like to use a winch with. Winches can pull up to as much as 18,000 pounds, depending on their strength. A few things to take into consideration are size of the winch, whether to get hydraulic or not and even the type of cable that the winch uses. Strength, otherwise known as capacity, varies greatly. I good standard by which you might choose the capacity that you need is to determine the weight of the vehicle you are installing the winch on and then double that weight. Your sum should be what you look for in a winch. A heavy duty pick-up truck is obviously going to need a much larger winch than a four-wheel ATV. Your choices of power are electric or hydraulic. Electric winches harness the power of the vehicle’s battery and they are the most common type of winch on the market. Hydraulic winches are hooked to the power steering pump on the vehicle and utilize the fluid from that pump to reel in the cable. The main reason that anyone might prefer the hydraulic over the electric is that the hydraulic pump is not going to fail in wet situations, such as being in water. Another reason is that if the vehicle’s battery should fail completely, then the winch would not work. The down side to using hydraulic winches are that they are harder to install and not always available for each vehicle you are attempting to install it on.Two different styles of cable are now manufactured to be used with winches: steel and synthetic. Steel is popular, easy to replace, extremely strong and resistant to cuts and wear. The biggest con with steel is that it can corrode and when it breaks it can be very dangerous. The snap of a steel cable can cause serious injury and in some rare cases even death. The synthetic cables are a thinner line that don’t hold as much weight. If they break they do not tend to cause as much damage. By not pulling as much weight or holding as much tension, synthetic cables to not do nearly they damage when they break. These are all just some quick tips. Please, read carefully and do your own research when it comes to fitting your vehicle with the proper winch for the job you need it to do.